The workspace provisioning and streaming platform oneclick™, available as a service worldwide, can be applied in a large number of areas and helps map various scenarios. Via oneclick™, applications and data from any server location (on-premise, cloud) can be provided as a stream in a central workspace in the browser. Users access their secure, mobile work space environment with any terminal device. Keep reading to learn about some of the many use cases which can be handled successfully with oneclick™. Companies need to always keep their external sales team up to date in order to ensure a productive sales operation. Their technical equipment has to meet high requirements and security standards. A connection to the company’s business applications, such as ERP and CRM systems, is essential and forms the basis for productive working in external sales or from a home office. This poses big challenges for companies. Staff work remotely, applications are either installed on premises and are deployed via an insecure connection or, in a worst case scenario, the software is installed locally on the employees‘ mobile computers. A simple version update or a newly introduced sector software result in a great deal of work for the IT department. Using the oneclick™ platform, both on-premises as well as SaaS applications can be deployed via a web-based platform and made available to the external sales team 100% in the browser. The users log into the oneclick™ platform and have immediate access – from any location – to all required applications. The connection is straightforward as no local clients have to be installed on mobile devices. Additionally, the connection is highly encrypted. By using oneclick™, access to the business applications can also be secured further with a two-factor authentication, without changing anything about the software provided by the company. The previously obligatory VPN client is no longer necessary either and needs no replacement. Only an up-to-date web browser and internet access are required to use oneclick™. The IT manager logs into the central platform of oneclick™ to administer the systems and has immediate access to a clearly laid out administration area. Here it is possible to connect infrastructures and allocate available software to staff. New applications or updates are centrally managed by the administrators. As soon as users log in again, they access the latest version. Numerous employees and companies face big challenges when trying to remotely gain access to their company network. Normally, VPN access is established, which involves complicated and complex handling of the necessary clients. Additionally, there are often problems with speed, as VPN restricts the transmission rate in many cases. VPN also reaches its limits quickly with regards to security. As a VPN tunnel represents a direct connection into the company network, a stolen or compromised end device may become a fatal security risk for sensitive data and IT infrastructure. Problems with firewalls are not uncommon either. In some countries, the use of VPN connections is not even permitted, which means that the company network cannot be reached at all during business trips. The oneclick™ platform does not require any local installations. Clients or plug-ins do not have to be used neither on company servers, nor on individual end devices. Users access their digital workspace via a secure web portal. All a user needs is an end device with an HTML5 supported browser and an internet connection. This guarantees productive and secure working even with low bandwidths. For this purpose, the oneclick™ platform is connected to the existing IT infrastructure. The user does not gain direct access to the data via oneclick™, but only receives a streamed and encrypted view of the data. In contrast to traditional VPN client scenarios, no application data streams or data leave the company network. Thus, oneclick™ fulfils the out-of-the-box increased compliance and data protection requirements. The comprehensive security mechanisms of the oneclick™ platform serve as a protective shield for the company network, which increases the security level significantly in contrast to the common VPN client use. In this way, oneclick™ enables external access to the internal company network, as well as applications and data available there, from almost any country in the world. For networked work, many companies use an internal Sharepoint server as a platform for collaboration and structured data storage. Most of the time, this is operated on-premise within the company. Sensitive information and data are shared and processed in Sharepoint. Companies do not wish to share this business-critical data outside of their operation and therefore rely on internal hosting. Nonetheless, for efficient working, it is often desired and necessary for project participants, external sales and mobile staff to have secure access to data stored company-internally. Internal guidelines, compliance requirements, security concerns, technical possibilities and data protection topics are often opposed to this. These problems are fully solved by the use of the oneclick™ platform. With oneclick™, company internal Sharepoint instances can continue to be operated on-premises, while still offering mobile, secure as well as external access to the content. Internal pages, data and rooms remain on the company servers, while a secure access on Sharepoint is set up for mobile project staff and employees working from home. No information and in particular no data leave the business location, as only an encrypted stream is transmitted to end devices. 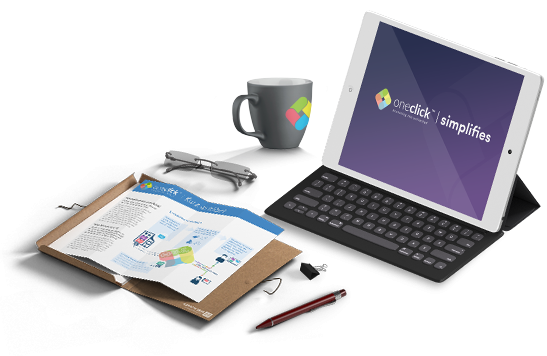 This means that oneclick™ enriches existing on-premise applications and combines them with the benefits of the cloud. Worldwide and secure access is guaranteed at any time, without the need to install clients or plug-ins on terminal devices. Networked company structures in times of digitalisation require staff’s mobile access to internal storage systems. Documentation as well as sensitive company data or internal files need to be accessed while on the move and are therefore vulnerable, as they are cached or at worst saved locally as a copy. Especially with regards to the EU General Data Protection Regulation (GDPR), such access presents businesses with big challenges, as data sovereignty and security is regulated by law. Accordingly, personal data and files have to remain under complete control of the business, which gets in the way of employees’ requirements regarding mobility. With the help of the oneclick™ platform, both requirements are fulfilled. Through the provision of data via oneclick™, users receive mobile access to selected files, which they require for their work. Encrypted stored data never leaves its original storage location as, due to the streaming technology in use, the user only receives a filmed image of the file transmitted. Changes to the files are brought about through control signals transmitted in an isolated way. An active data exchange between company network and end device takes place via the cloud storage integrated into the platform, oneclick™ Drive. The Web Fileshare supports allocation of access authorisations for folders or individual files, whereby certain persons are permitted or denied access to selected directories. If requested, actual data access can be recorded and used for audits if required. Many companies, which operate branch offices or regional subsidiaries, encounter problems in the provisioning and distribution of their software applications. Different architecture types can be found in such organisations. The locations either have an independent IT department, which administers its own part of the infrastructure, or a central IT department is responsible for the entire company IT. In either case, the provisioning of external locations with the required software creates a heavy workload. In conventional structures, subsidiaries are connected to the head office via a site-to-site VPN connection. In the process, those responsible for IT struggle with high complexity and have to adhere to comprehensive security requirements and compliance guidelines. There are also high costs for set-up, administration and maintenance of the external location’s connections to the business’s head office. Frequently, leased lines and internationally even MPLS are used. IT structures are simplified with oneclick™, while at the same time the security level is increased and administration cost reduced. Without an application provision via oneclick™, a site-to-site VPN connection has to be set up for every subsidiary. The use of the oneclick™ platform means that multiple VPN connections are no longer necessary to equip branches and subsidiaries with the required applications. Software and data are made available to users in 100% web-based, digital workspaces. User log into their personal workspace and have access to the applications allocated to them. Complex VPN clients, MPLS and leased lines are a thing of the past with oneclick™. All you need in order to use oneclick™, is a browser and common broadband internet access. The entire company IT is securely sealed off from the internet and benefits from additional protection mechanisms. By using oneclick™, access to company applications can easily be complemented with a 2-factor authentication, without having to make any changes to the software provided by the company. At short notice, mobiz needed a solution to enable customers access to a terminal server environment, without having to set up a complex VPN. Another requirement was that users should only have the opportunity to access individual applications or servers, but not the complete network. There are few VPN solutions, which can include several end points, without the users having to handle several VPN clients. Document management applications for pharmacies were to be provided. As it was unclear at the beginning how big demand for the offer would be, the environment had to be scaleable. Already in use was a simple firewall with a relatively small set of rules. By using oneclick™, the access problem to several end points and related VPN clients no longer exists. A workspace in a browser enables the user central access to all authorised applications and servers. A central gateway service and via a secure authentication and deployment procedure, the oneclick™ platform provides access to all connected resources. oneclick™ also offers multitenancy. Any number of sub-organisations, departments or group can be formed during user set-up. According to the user profile, applications and servers are released and deployed. mobile.de works with an external call centre service provider to deliver dealer support. In order to increase sales efficiency, a performant customer interaction solution was to be introduced and integrated in the existing CRM system. A key criteria was the provisioning via the browser. Agents were also to receive access to all utilised programmes via a central work interface, without having to switch between several screens. Another requirement was special protection of sensitive customer data and high IT security. Due to compliance reasons, access and use of the data should be controlled centrally and in real-time. The deployment platform had to pass the strict information security checks of the American parent company ebay Inc. The customer interaction solution “Elsbeth“ of Enghouse AG is deployed 100% web-based to call centre agents in distributed locations using oneclick™, without having to install clients or plug-ins on end devices. This facilitates the roll-out of the software considerably. New workspaces can be equipped within seconds, while agents have access via the browser with any device. If an agent no longer works on a project, then the licenses are immediately withdrawn. oneclick™ deploys applications, data and voice as an encrypted stream to the agents in a highly secure way. Another benefit is automation of the provisioning. When a new user is set-up in oneclick™, the platform takes over the set-up in all involved systems, such as RDS, SIP-Proxy as well as the application itself. This saves valuable time during user set-up.